Penelope Anne Constance Hatfield was born in Sutton, Surrey in 1940. She was brought up in Clacton by her mother, Connie, after her father walked out on the family when Penelope was a baby. 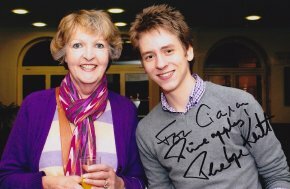 I met Penelope Keith at the Theatre Royal in Nottingham, in October 2010, after her performance as Mrs Malaprop in Sheridan's play The Rivals. I saw her again the following day when she signed a print of this photograph for me - adding the word 'Pineapples!' (a malapropism from the play). When she was six years old, Penelope was sent away to a Catholic boarding school (although she was not a Catholic) in Seaford, East Sussex. 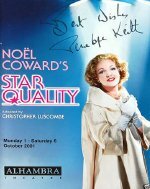 Whilst there she became interested in acting, and would often be taken by her mother to theatre matinees in London's West End. Her mother remarried in 1948 and Penelope adopted her stepfather's surname of Keith. of Speech and Drama, but rejected because of her height. She was later accepted at the Webber Douglas Academy of Dramatic Art and, during her two years there, also did evening work at the Hyde Park Hotel. As an actress, she worked in repertory in Chesterfield (her very first role was as Alice Pepper in Joseph Field's Tunnel of Love at the Civic Theatre in 1959), Manchester, Lin- coln and Salisbury. (2006) and Mrs Malaprop in Richard Sheridan's The Rivals (2010). made an appearance on The Morecambe & Wise Show. 1977 for her role as Margo. In a BBC poll, The Good Life was voted 9th favourite 'sitcom' of all time. 'Christmas Special' episode in 2007. Peter Bowles co-starred as a supermarket boss Richard De Vere who buys Audrey's Manor House. She then moves into the Old Lodge nearby to keep an eye on him! Jean Price in No Job for a Lady (1990-92); the barrister Phillippa Troy in Law and Disorder (1994) and Maggie in Next of Kin (1995-96). 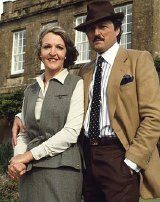 Executive Stress was yet another series where Penelope Keith teamed up with Peter Bowles for the second & third series. (1976); The Norman Conquests (1977); On Approval (1982) with Jeremy Brett; Coming Home (1998) with Peter O'Toole &. about the Edwardian motoring pioneer Dorothy Levitt. With so much TV and theatre work, Penelope's film work has been limited to very minor roles in no more than half a dozen productions. 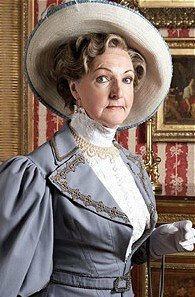 Penelope Keith's highly recognisable voice has been heard in adverts for Tesco, Pimms, Lurpak and for Parker Pens. She also provided the narration for the children's series The Teletubbies. 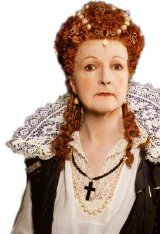 Penelope Keith is married to an ex-policeman Rodney Timson, and they have two adopted sons. 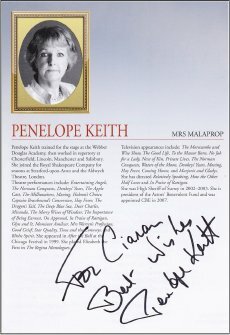 Penelope Keith was made an OBE in 1990, and received the CBE in the 2007 New Year Honours for her services to charity. For the past 20 years, she has been President of the Actors' Benevolent Fund, and is also a Royal British Legion volunteer. In 2002 she served for one year as the High Sheriff of Surrey, and she is also a Deputy Lieutenant of Surrey. 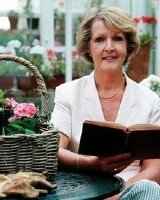 A keen gardener, Penelope Keith had a rose named after her in 1984. 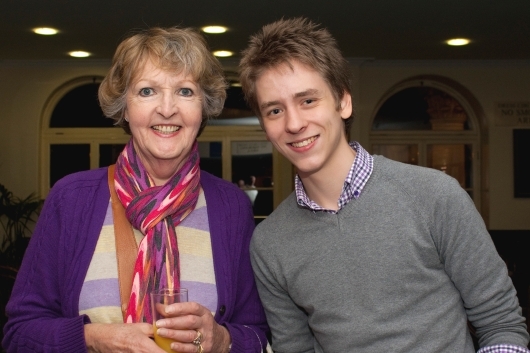 Penelope Keith was made a Dame in the 2014 New Year Honours list.